From 5,000 feet above, the Missouri River Breaks looks as rugged and remote as its reputation. Rolling, treeless ridges drop into craggy coulees that fall toward the Missouri River. The vast landscape is as wild as it is beautiful. It's also roadless, save for a few four-wheel-drive trails that wind along the ridgelines before ending at sheer bluffs. The Breaks, as locals call the region, offers some of the best elk and deer hunting in the country. It's also home to bighorn sheep, turkeys, and upland birds. Even better, the 175,000 acres of remote, undulating landscape are administered by the Bureau of Land Management (BLM). It's your land, and it's open to public hunting and the enjoyment of generations of outdoorsmen. If some members of Congress get their way, the Breaks, along with millions of acres of other public land, may go on the auction block. Impossible? The sale of national forest and BLM land may seem like little more than an environmentalist's conspiracy theory or a far-fetched plan that would never get past public outrage. However, seven Western states have passed legislation asking the federal government to turn federal lands over to state governments. If that's not frightening enough, Congressman Paul Ryan (R-WI), the chairman of the House Budget Committee, mentioned the "sale of unneeded federal property" in his 2012 budget proposal. Utah Representative Jason Chaffetz (R) introduced H.R. 2657, titled "The Disposal of Excess Federal Lands Act of 2013." It directs the Secretary of the Interior to sell millions of acres of land in 10 Western states. The proceeds would go toward decreasing the federal debt. Fortunately, the bill is stalled in committee. Even if Chaffetz's legislation goes nowhere, it signals a disturbing trend, says Backcountry Hunters and Anglers Executive Director Land Tawney. A number of state and federal legislators have long pushed for the return of federal land to the states. They insist individual states can manage the land better than the federal government. Tawney isn't buying it. "The management of national forests and BLM lands is expensive. Road maintenance and firefighting budgets alone can add up to millions. If states took control of federal land, how would they pay for the upkeep? They would either raise taxes or sell land, and we know how unpopular the idea of raising taxes is," says Tawney. One study found that Montana would lose $200 million per year managing what is currently federal land, even after various revenue streams were taken into account. Aside from the direct monetary loss, selling even small blocks of federal land, tracts deemed "surplus" or "unneeded" by legislators, could have disastrous consequences for hunters. Any loss of public land translates to fewer opportunities. "All it takes is the sale of one small parcel of public land that connects to a large tract of public land. If that smaller parcel gets sold, then we've lost access to the large tract," he says. Even if they don't actually sell it, some states may see a different financial windfall from the control of public land: oil and gas leases, mining, and other threats to game and non-game populations. That's why a number of conservation groups are pushing new designations for large tracts of BLM land, including the region of the Missouri River Breaks that has no established protections. Dubbed Backcountry Conservation Areas (BCA), the concept would add protections to places, like the Breaks, that currently have no specific protection other than federal ownership. The land isn't worthy of wilderness designation. However, its value to hunters, anglers, and other outdoors enthusiasts is just as strong. The idea, says Joel Webster, director of the Theodore Roosevelt Conservation Partnership's Center for Western Lands, is to maintain areas like the Breaks as they are. All current activities, including hunting, camping, grazing, even the use of motorized vehicles, would remain legal. However, the BCA designation would stop future degradation from such things as energy and mineral extraction, cross-country power lines, and additional roads, things that would take away from the wildness of such places and harm wildlife and hunting opportunities. "We don't want to stop things like power lines or pipe lines. We just think they should be rerouted around areas that deserve protection. We know that power line towers and drilling rigs are a contributing factor in the decline of sage grouse. Energy extraction is also harmful to local mule deer populations," says Webster. The BLM is in the process of revising its management plans for about half of the agency's 245 million acres of public land, almost all of which lies in the West. The revisions will shape management and land use activities for decades. Although much of the land under BLM oversight would not qualify for BCA designation, dozens of large tracts throughout the West would. "This is a great opportunity to preserve land that provides so many benefits to hunters and anglers. We have to look out for what's best for us if we want to continue to have the high-quality opportunities we have in these large tracts of BLM land," says Webster. "The BCA designation requires no legislation, only adoption by the BLM." Such a plan would benefit hunters only if public lands stay in the public's hands. It's unlikely nonprofit conservation groups could compete with millionaires, billionaires, and overseas corporate interests if a modern land rush did take place. However, groups like Pheasants Forever and the Rocky Mountain Elk Foundation are doing what they can with what they have. Both groups, along with other pro-hunting conservation organizations, are buying land in an effort to preserve the best and the most at-risk habitat when it becomes available. So far, PF has purchased 1,313 parcels totaling 161,857 acres. All of it is open to public hunting. The RMEF has bought easements or title to about 1 million acres in the last 30 years, including a 40-acre Montana parcel that opened access to 18,000 acres of national forest. The land was transferred to Montana, Fish, Wildlife and Parks. "We try to only buy land that is marginal crop land or associated with wetlands, which is often also very good pheasant habitat," says Pheasants Forever Vice President of Corporate Relations Joe Duggan. "We typically are not interested in high-quality farm land. It tends to be very expensive." Even marginal land can be expensive, but Duggan says his organization often partners with other groups, even state or federal agencies, to put the deal together. In most cases, conservation groups buy land and then turn it over to state wildlife agencies or the U.S. Fish and Wildlife Service, which typically converts the land to Waterfowl Production Areas. However, the USFWS service is a federal agency. Much of the land it controls would bring top dollar from well-heeled duck hunters if it went on the auction block. "That's certainly something that concerns us," says Duggan. "However, the talk of selling federal land mostly centers around BLM and national forest land. Much of the land controlled by the Fish and Wildlife Service is either refuge or waterfowl production areas, which are purchased through duck stamp revenue. I think if there was any attempt to sell land bought and paid for with sportsmen's dollars, there would be hell to pay." 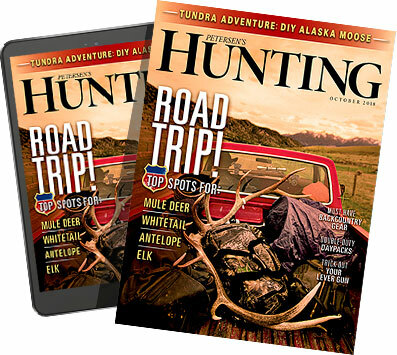 For more information, pick up a copy of the December/January issue of Petersen's Hunting on newsstands now!